Imagine the stories that animals would tell us if only we could understand them. 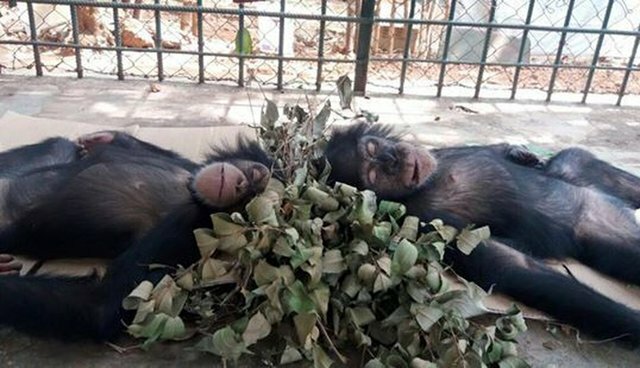 That's the situation the team at Tacugama Chimpanzee Sanctuary (TCS) is facing as it cares for two rescued chimps - the very talkative Tigo and his sister, Linda. For years, a family in Sierra Leone kept Linda and Tigo chained up in small bamboo cages. Unfortunately, such conditions are typical for animals kept as exotic pets. Earlier this year, Sierra Leone's National Protected Area Authority confiscated the two chimps and transferred them to TCS, which provides a home for chimps who can't survive in the wild. Since then, the siblings have gotten the chance to blossom. "They both have very big personalities that really have started coming out," TCS wrote in a Facebook post last month. "Linda is very playful and spends the whole day swinging in the ropes in her enclosure or building nests." "Tigo is a very vocal chimpanzee and tells us many stories every day," the group added. "We just wish we were more fluent in 'chimpanzee' so we would know what they were all about." Now, a month later, the two are continuing to make progress, passing their second health check and remaining playful in their new setting. Here they are after waking up from their latest health check. Since the chimps arrived at TCS, the staff has kept them quarantined off from the other chimps at the sanctuary until it's certain they won't bring any diseases to the group. If they continue to be in good health, they will have even more exciting days ahead when they meet their new family at the sanctuary. Here are a few of the happy faces they'll hopefully get to meet. Visit Tacugama Chimpanzee Sanctuary's Facebook page to learn more about the rescued chimps of Sierre Leone.